Six individual (4 oz.) packages of delicious Whittington's jerky. 1/4 lb. 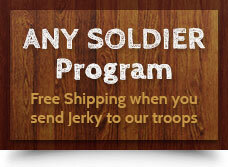 each of: Original Beef Jerky, Hot Beef Jerky, Garlic Beef Jerky, Traditional Turkey Jerky, Spicy Turkey Jerky and Pork Jerky.